Even though the temperature isn’t really saying “fall is here” in our area the garden certainly is. We’ve been harvesting pumpkins, winter squash, and popcorn and sowing fall successions of beets, lettuce, and cabbage. 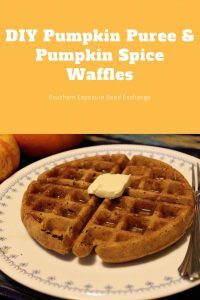 With this and my love of all things autumn in mind I decided it’s time to bring out the fall recipes. 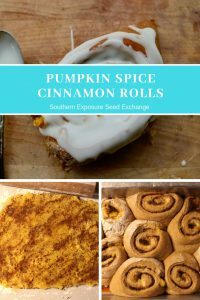 These cinnamon buns are a delicious way to start enjoying the autumn harvest without breaking out the pumpkin pie. They’re delicious and fairly easy to make. Never made your own pumpkin puree? Check out this post. Raised rolls ready for the oven. 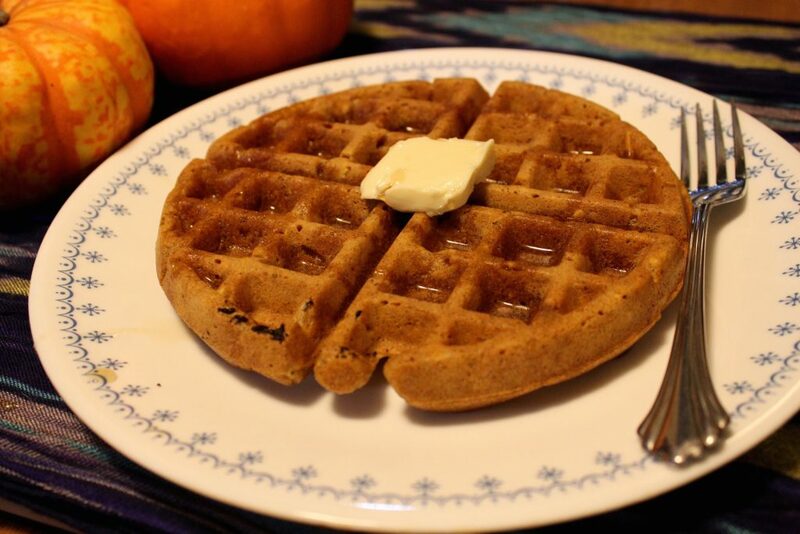 To begin combine the milk, oil or butter, molasses, puree into a microwaveable bowl or small saucepan. Heat these ingredients until they’re quite warm but not hot. In a separate bowl combine the sugar, spices, salt, and yeast. Once the liquid ingredients are warm pour them into the bowl as well. Stir until well mixed and then begin adding the flour a little bit at a time. As the dough gets hard to mix you can turn it out onto a well floured surface and knead it with your hands. You’ll know you’ve added enough flour when the dough forms a nice ball and is tacky but not sticky. Now allow the dough to rest for about 5 minutes. Next roll the dough into a rectangle. I generally roll the dough between 1/4-1/2 inch thick though you can change this to suit your preference. 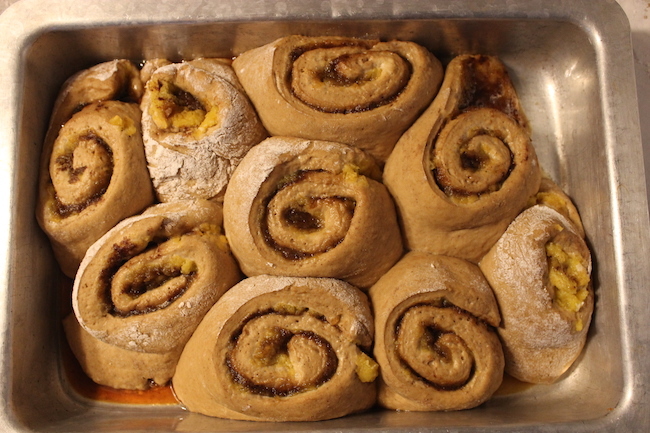 Dough with butter, pumpkin, puree, and spices. Still needs sugar. Now you can spread the filling. First soften or melt the butter and mix it with the pumpkin puree and spread this in a thin layer on the dough. 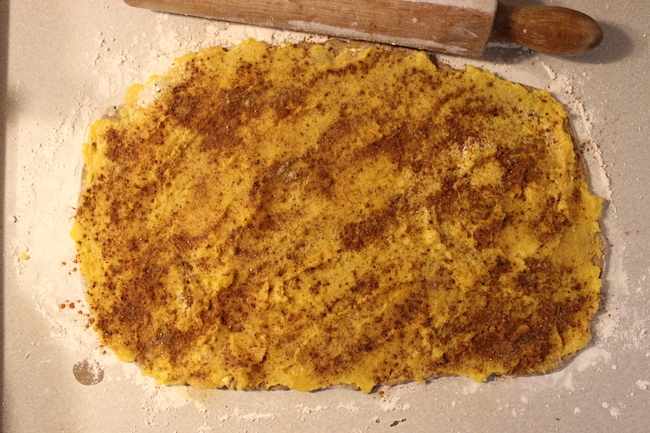 Then sprinkle the spices (alternatively you can use a pre-made pumpkin spice mix) evenly over the dough. Do the same with the brown sugar. I rarely measure the spices or sugar and just go by eye. Roll the dough into a long tube and slice it into 8-12 pieces and place them into a greased, 9×13 inch baking pan. Place the pan somewhere warm and let them raise for 2-3 hours until they have doubled in size. Bake at 350°F for about 25 minutes until they’re golden brown. To make icing combine the powdered sugar and vanilla and stir in the milk a tablespoon at a time until it reaches your desired thickness. 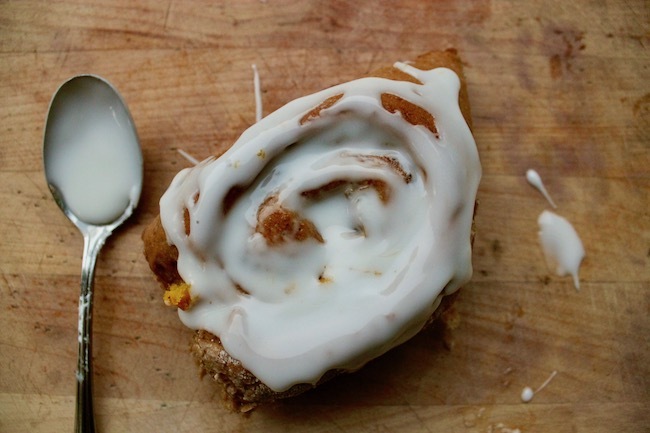 Icing should be added after the cinnamon rolls cool. How do you tell they’re ripe? If you’ve never done it before determining if winter squash is ripe can be a bit more difficult than picking tomatoes or green beans. It’s also very important that it is ripe if you want it to store well through the winter. 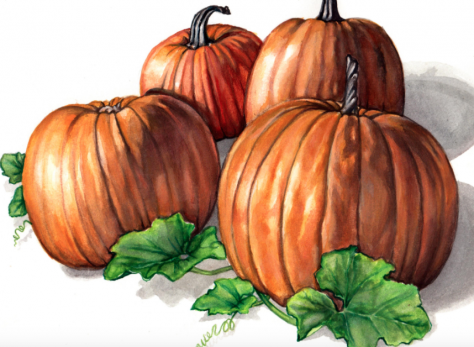 The biggest indicator that winter squash and pumpkins are ready to be harvested is their stems. The stems should be hard and dry. Often you can tell that the plant is beginning to die. The fruits should also be their mature color and sound hollow when patted with an open hand. When they’re ready it’s time to harvest! Simply cut the fruit from the plant, leaving about 1 inch of stem with a knife or garden shears. Lightly wipe off large clumps of dirt with your hand. Never carry your squash or pumpkin by their stem as breaking them off often drastically reduces their storage ability. Also try to avoid handling them roughly to reduce bruising and nicks. If a hard frost is imminent you should go ahead and harvest any squash left on the vine even if it’s not perfectly ready. Hard frosts can damage squash and make them rot. Just keep in mind that squash harvested early may not keep quite as long so it should be used first. Leaving a longer stem can help them finish maturing properly. 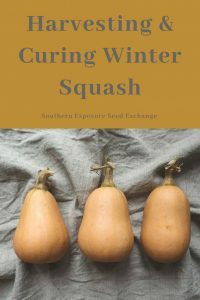 Before you can store your winter squash it needs to be cured for about 7-10 days depending upon the variety. The best way to cure squash is to lay it out on a dry surface with enough space for air to move around it. Every day or so your squash should be moved or turned over to a new position. A picnic table in your yard will work if the weather’s still warm enough, a pallet in your hoop house, your kitchen table, or even sunny windowsill. The curing process allows the skin to toughen up so that your squash will be ready for storage. 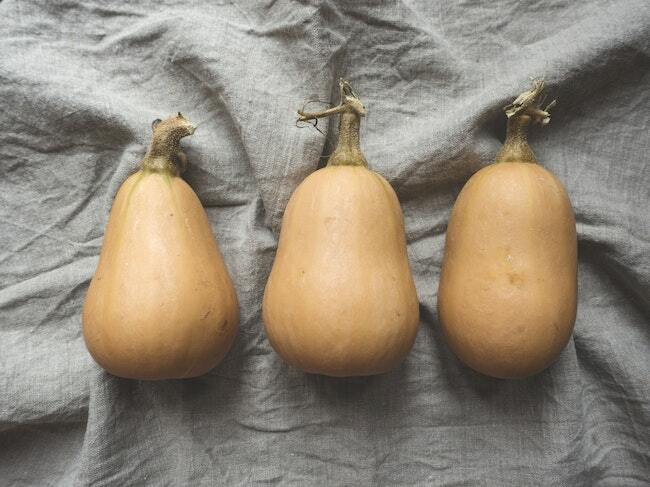 Winter squash is one of the lovely foods that takes little effort to store at home. Ideally you should find a dry place to store your squash where the temperature stays between 50°F and 68°F degrees. You might find a place in a spare bedroom, office, under a bed, or in a coat closet. You should store your squash in a single layer and not touching. That way if one begins to rot it won’t effect the others. While your squash is in storage you should be careful to check it at least once a week for soft spots or mold. Use any squash that are starting to go bad immediately.